Civilization 3 was the first Civilization I actually bought with money. It was released in 2001, and by that point I wasn’t having to rely on bootleg copies or swiping my brother’s Civilization 2 CD when he wasn’t looking; I was still in sixth form1 but had a small amount of disposable income thanks to a rather unpleasant summer job, and so I wandered down to Dixons2 the lunchtime of release day and bought what might actually have been my very last big-box3 PC game ever. It was a big disappointment. Civilization 3 has two major problems, both of which were readily apparent to me at the time, but which are drawn into even sharper relief by an additional 18 years of playing 4X games. The first is that even in 2001 I thought it was a startlingly ugly game. 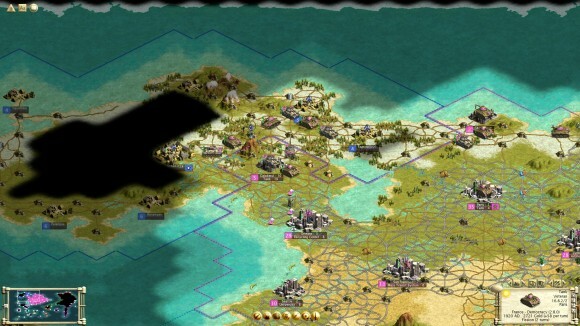 The colour palette that’s been chosen is far too light and makes the entire game look like it’s take place on a sun-drenched Pacific island, the tile art is crude and indistinct and features the brownest mountains in videogames, and the isometric perspective that seemed so fitting in Civilization 2 just looks incredibly flat here. In fact it’s interesting to note a couple of other games that ran into this problem: Call To Power and its sequel are both highly unattractive games that resemble nothing quite so much as a tabletop stuffed full of incoherent junk thanks to the isometric perspective. Alpha Centauri on the other hand has aged a little better; it’s handicapped a great deal by how brown the thing is, but it uses voxels to implement the concept of tiles having variable heights and this pseudo-3D nature is easier to parse two decades on and prevents the game from collapsing into a bland mass of nothing. Now, Civilization 3 did have something of a surprise for me here. When I initially booted Civilization 3 for a replay last week — only the second time I’d done so since Civilization 4 came out in 2005 — it was set to the 1024×768 resolution that was standard at the time and looked just as bad as it did when it first came out (and believe me, the intervening eighteen years haven’t helped it at all). However, these days there’s widescreen patches and/or hacks for just about every older strategy game out there, so I went looking for a way to upscale Civilization 3 to 1080p. It turns out this is quite easy to do by editing an .ini file, and so I discovered that some of Civilization 3’s rough edges disappear entirely at 1920×1080. Many of the UI components lose their jaggedness and the advisor portraits actually look pretty damn good, and while the actual map is still a goddamn mess and isn’t dramatically improved by being able to see more of it at once, the military units scattered across it are at least a little more attractive for having been made smaller and sharper. Civilization 3 is almost on the cusp of being acceptable-looking at 1080p, and it’s just a shame it came out a decade too early for that resolution to be an option. Civilization 3’s other problem is that it’s the first game in the series to make major changes to the classic Civilization formula. Given the almost-godlike status Civilization 2 had during the latter half of the 1990s this was something that I saw as sacreligious at the time. I was expecting something that was to Civilization 2 what Civ 2 was to the original Civilization: something evolutionary rather than revolutionary, something that was very recognisably the same game with some tweaks, additions and updated graphics.Instead I got a game where the visuals were arguably worse than in Civ 2 and Firaxis had taken a sledgehammer to the mechanics, smashing them into tiny pieces and reassembling them into something that, at best, only half-resembled what I recognised as being Civilization. I didn’t exactly hate the resulting game, but I definitely enjoyed it far less than Civilization 2 and didn’t really understand why they’d decided to mess with one of the best games of all time. Looking back on it with the benefit of eighteen years and another three games’ worth of hindsight, that reaction is partially on me rather than Civilization 3; the series can’t stay still forever and Civilization 3 had to do something to seriously shake up the game mechanics if it was going to avoid the kind of stagnation that the RTS genre was undergoing at around about the same time. In fact, the first thing that struck me when I went back to it recently with a fresh pair of eyes is how forward-thinking Civilization 3 really is, since most of what it introduced has gone on to form the core building blocks of modern Civilization. Things like tile improvements being split off from Settlers and handed to a dedicated Worker unit. Giving your cities a clearly-defined set of borders around their territory, along with a new Culture resource that drives the expansion of your city borders and which can make neighbouring enemy cities revolt and join your empire. Switching unit maintenance to cost money instead of production. The arrival of the modern diplomatic interface4 and the ability to make deals that go beyond technology trading and peace treaties. Strategic resources that allow you to build certain units and improvements. National wonders that can be built by every civilization as long as you fulfil the prerequisite conditions. Bombardment of enemy cities and units to weaken a strong defensive position. Even great leaders, albeit in an extremely prototypical form where they can’t do a whole lot yet. It’s really quite remarkable how much new ground Civilization 3 broke, and how much of it was later polished into excellence by Civilization 4 in particular. Because I was now coming at it from the world of modern Civ, where all of those mechanics are now commonplace, I initially found myself enjoying my playthrough of Civilization 3 far more than I was expecting to. The biggest issues the new mechanics have during those first few hours stem from the fact that the implementation isn’t quite there yet, and that they have to coexist with an underlying structure that’s still — just about — driven by the same concepts that were at the core of Civilization 2. 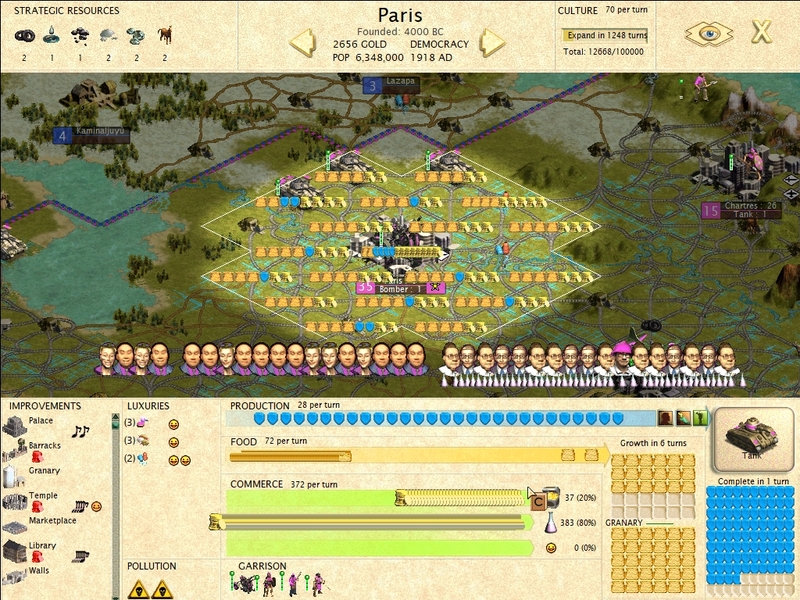 For example, Civilization 3 makes the conceptual leap of introducing a cheaper Worker unit to handle building tile improvements, but still makes building a Worker cost a unit of city population just like a Settler, which feels totally ridiculous given how valuable the first few units of each city’s population are. It shows you where your civilization borders are for the first time in the series, but the AI is still just as aggressive with its own colonization efforts and seeing it hike across your territory to settle in the single square that wasn’t covered by your borders — even though that square was in the middle of desert — is a thousand times more obnoxious than anything it got up to in Civilization 2. 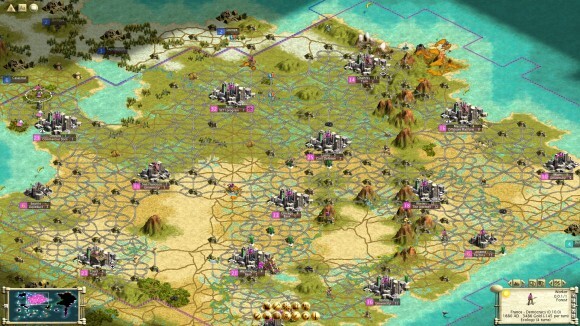 It introduces strategic resources such as coal, rubber and aluminium which are required to build certain units and improvements, but makes the mistake of making that a hard requirement rather than a soft one — so rather than the resource boosting your build speed, or having a less-powerful alternative that’s always available, if you aren’t lucky enough to have one of that resource within your civilization borders (and remember, you can’t see where they’ve spawned until you research the appropriate technology) then you’re screwed unless you declare war on a neighbouring AI that does have it. This gives Civilization 3 a sort of lumpy, half-baked feel, especially in light of later games which perfected the new mechanics, but for the first few hours it’s not enough to get in the way of the game being fun. Or at least interesting; despite all of this new stuff Civilization 3 is still playing with a paradigm where Libraries increase science by 50%, your choice of government types are split between Monarchy/Republic and Communism/Democracy (albeit with a third alternative of Fascism bolted into the modern era), and military combat is decided by comparing the same attack/defence values that have been in every Civilization to date. The new bits don’t sit with the old all that well, but I can’t deny that watching them attempt to coexist is fascinating, and up until the endgame the friction between the two isn’t yet so great that the whole thing bursts into flames. It’s pleasant to play something that, at times, feels quite like classic Civ with many of the quality-of-life features I found myself missing in Civilization 2, as well as a few ideas that were killed before they could make it into Civilization 4. You can sacrifice Workers to claim resources outside of your territory with Colonies, which would have been very helpful for those silver and fur deposits that crop up in the frozen north without having to build the city from Frostpunk to get at them, and the Civilization 3 spin on the tech tree is pretty novel, with most branches ending in clearly-marked dead ends that nevertheless give you access to powerful Wonders, buildings and units, while the main route up to the top of the tree only gives you the barest minimum to get by. I understand why those ideas weren’t taken forward from here, but they highlight just how experimental Civilization 3 is and, given that the vast majority of it still exists in modern games in some form, how successful that experiment ultimately was. That payoff was still several years (and another game) distant, though. Even going back to it now, bereft of prejudice, there are too many pain points in Civilization 3 to be properly consumed by it the way I was in the previous two games I replayed, and those pain points become positively agonising once you hit the endgame. The number one culprit is the strategic resource system, which seems designed to force you into wars more than anything else. For example, a key part of Civilization since the very beginning of the series has been beelining for railroads since they boost the yields of the tiles they build them on. Later titles toned the bonus down, or made it selective, but in Civilization 3 railroads are still boosting tile yields by +1 per Irrigation or Mine (and every tile has one of those two improvements on it), so getting access to them is kind of a big deal. It’s the first and most important step your civilization takes along the road from medieval subsistence to modern mastery. Unfortunately Civilization 3 chooses to gate the ability to build railroads behind access to Coal; if you don’t have a Coal resource, you can’t build railroads. Period. You could try and trade for Coal, but this relies upon the AI knowing what Coal is (it’s not visible until you get Steam Power) and having it hooked up to their road network with a mine. If you’re in the situation of having beelined for Railroads you likely have a big tech advantage anyway, so it’s far more practical to declare war and seize a nearby Coal deposit by force before your civilization falls behind again. It’s at this point that Civilization 3’s second major pain point rears its ugly head: combat between military units has actually regressed from Civilization 2. We’re still fighting out combat over multiple rounds via a comparison of attack/defence values, but in Civilization 2 a more advanced unit had more HP, meaning that even if a spearman was fighting a tank and got a lucky roll it was still likely to lose the overall combat because the tank had so much more HP to wear down. In Civilization 3, though, we’re back to all units having the same amount of HP regardless of era; Green units start with 3 HP, Veterans have 4 HP and Elite units have 5 HP, and that holds true whether the unit in question is high-tech mechanized infantry or a man holding a stick. I appreciate that we’re starting to sketch the outline of a proper unit veterancy system here, but by giving both the spearman and the tank the same base HP we’re back to a world where a spearman can — with the appropriate boosts from fortification, city walls etc — beat a tank. It just happens a bit less because it needs three lucky rolls instead of one. So fighting another civilization in Civilization 3 can be very annoying; you suffer attrition even if you’ve brought a huge technological advantage to the fight, so you also need to go in with overwhelming force to make up for it, which leads to micromanaging dozens of units just to put down a bunch of hicks who are barely out of the stone age. Still, let’s assume you’ve won that war, and you’ve now got your Coal, and are happily building Railroads everywhere. You then get the tech required to build Infantry — a key, key unit that in other Civilization games is the thing you build if you can’t build Tanks yet — only to discover that they require Rubber. Tanks? Those require Oil. Good luck prosecuting a war in the modern era without those two resources. And of course I’ve left the best for last: if you are going for a Spaceship victory you’re likely in for a rude shock when you research Rocketry, because that’s the point when you find out that your empire has no Aluminum, which is — you’ve guessed it — a hard requirement to build the spaceship. 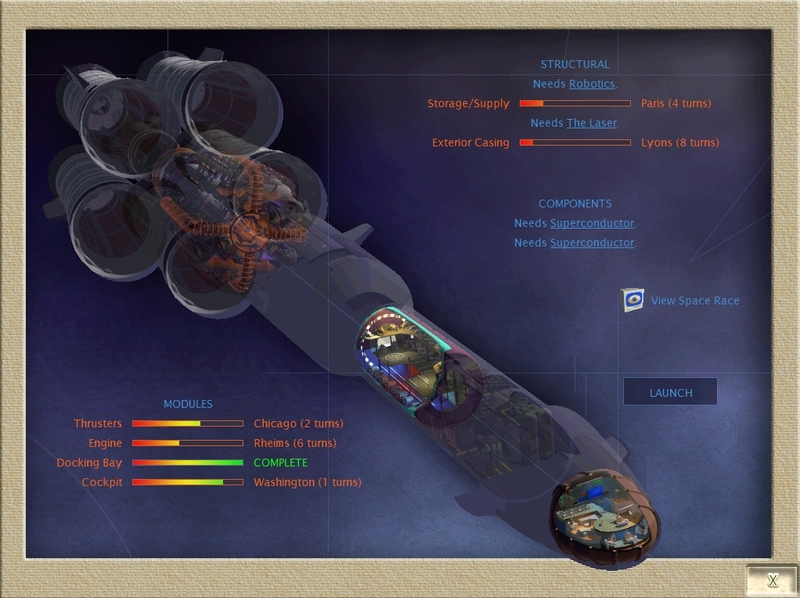 (Not that Civilization 3 will surface this; it just won’t display the spaceship options in the build menu, which led to some baffled searching through game options because I thought I’d somehow managed to turn the Spaceship Victory off.) If you don’t have it you need to go and get it, which means that even if you’re going for the non-violent Science Victory you need to fight multiple wars to keep your technological advantage and build the sodding thing. This is why my dominant memory of Civilization 3 from when I originally played it is of an infinite series of wars, and going back to it with more experienced eyes it’s interesting that a) I had almost exactly the same experience and b) I can finally pinpoint why it annoyed me so much: it’s forcing the player to play in one specific way, when Civilization is supposed to accommodate a range of playstyles. It’s proof that while I might have been a little unfair on the game in the past, most of Civilization 3’s problems are very real and its reputation as The Worst Civilization is entirely deserved. However, it also did a remarkable amount to move the series forward in terms of mechanics; never mind that many of the changes don’t successfully land, it’s enough that Civilization 3 dared to make them in the first place, because it opened up the design space for subsequent games to make them actually good. I’m not going to call Civilization 3 a visionary game, but it was definitely a necessary one since without it I don’t think we’d have any of the modern games, and Civilization 4 especially would have been a profound loss. Given that, I’ll grudgingly accept the way it turned out, especially now that I never have to play it ever again. Funny thing about the tech tree and it’s relative free-form nature in Civ3. 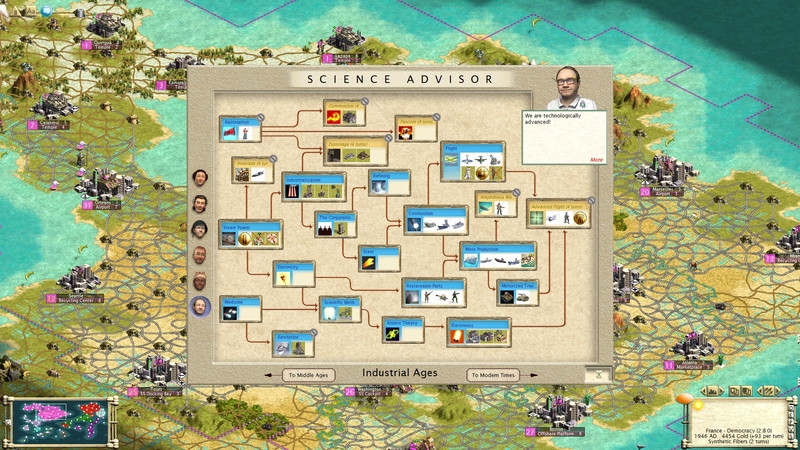 Many players play Civ as a roleplaying experience and they define their path by what they research. It sounds like a naive way to play but it makes total sense and it’s sad that Civ went away from it. Civ4 still had some freedom in its tech, mostly about Religion tech not being a requirement for anything (though it sounds a little STEM ignorant), same for navy I think. But since Civ5 we’re firmly in linear development land with prioritization. And you define your civ mostly by culture/government stuff that is presented as a clear choice. Reminds me switch from oldschool RPGs to new school ones: in oldschool your path was defined by what missions you agree to complete while in newer ones it’s assumed you’ll do everything but from time to time you’re asked if you’re gonna be good/evil/chaotic/idealist/etc about it. Still hope that something like Endless games tech eras will come into Civ. 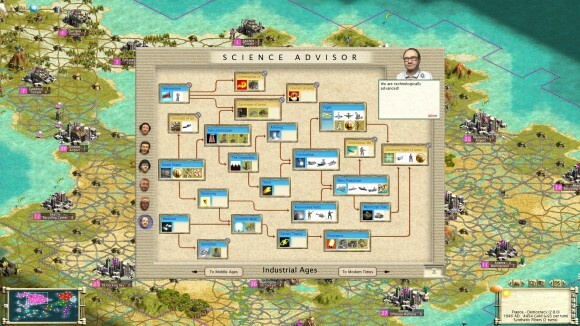 It would be much more interesting thematically cause techs in Endless games are fantasy technobabble while in Civ it would be interesting to define your civilization as the one who didn’t care about libraries and paper and only got those together with computers or something like that. Also, Civ3 OST sounds like a bad MIDI to me. Was disappointed when it was added to Civ4 in one of the expansions alongside live orchestra recorded masterpieces. Not for Heroes 4 And somehow the first King’s Bounty game (remake, not the first-first) doesn’t work right in 16:9. Its funny reading sentiments such as yours proclaiming Civ 3 the very worst of Civs, as this was my childhood. Civ 3 was my first civ, and therefore my attempts to examine past games in the series (or Alpha Centauri for that matter) have run across the shoals of missing features. No culture boundaries, truncated tech trees, having settlers also be workers, different cultures being mostly meaningless palate swaps, and having to track which cities individual units come from to make sure not too much upkeep is from any one place. 1. Is the end game combat really all that much worse in Civ 3 than Civ 2? From your description, Civ 2 has even worse ICS than Civ 3, with even tundra and desert cities eventually becoming worth it. 2. From what I read, Civilization 2 AI has a flag for turning all computer opponents hostile to the human player if they’re winning. So doesn’t the end game there also automatically include war, or has that not been your experience? 3. Did you ever try for a culture victory? I distinctly remember some games I played where I went for culture heavy civs such as Babylon and so long as I kept up my defenses, I was able to enjoy millennia of peace. I found it kinda dull, but that’s more due to the rather basic design of the culture win. If you feel like answering these questions, awesome. If not, cheers, no hard feelings. I look forward to your retrospective on Civ 4.